On the afternoon of February 20, 1943, Dionisio Pulido, a farmer in the Mexican state of Michoacán, was readying his fields for spring sowing when the ground nearby opened in a fissure about 150 fee long. "I then felt a thunder," he recalled later, "the trees trembled, and is was then I saw how, in the hole, the ground swelled and raised it self 2 or 21/2 meters high, and a kind of smoke or fine dust–gray, like ashes–began to rise, with a hiss or whistle, loud and continuous; and there was a smell of sulphur. I then became greatly frightened and tried to help unyoke one of the ox teams." Virtually under the farmer's feet, a volcano was being born. Pulido and the handful of other witnesses fled. By the next morning, when he returned, the cone had grown to a height of 30 feet and was "hurling out rocks with great violence." During the day, the come grew another 120 feet. That night, incandescent bombs blew more than 1,000 feet up into the darkness, and a slaglike mass of lava rolled over Pulido's cornfields. The scientific world was almost as stunned as the hapless farmer himself by the volcano's sudden appearance. Around the world, volcanic eruptions are commonplace, but the birth of an entirely new volcano, marked by the arrival at the earth's surface of a distinct vent from the magma chamber, is genuinely rare. In North America, only two new volcanoes have appeared in historic times. One of them was western Mexico's Jorullo, born in 1759 some 50 miles southeast of Dionisio Pulido's property. The second, born about 183 years later in Pulido's field, was named Paricutín for a nearby village that it eventually destroyed. Paricutín and Jorullo both rose in an area known for its volcanoes. Called the Mexican Volcanic Belt, the region stretches about 700 miles from east to west across southern Mexico. Geologists say that eruptive activity deposited a layer of volcanic rock some 6,000 feet thick, creating a high and fertile plateau. During summer months, the heights snag moisture-laden breezes from the Pacific Ocean; rich farmland, in turn, has made this belt the most populous region in Mexico. Though the region already boasted three of the country's four largest cities–Mexico City, Puebla, and Guadalajara–the area around Paricutín, some 200 miles west of the capital, was still a peaceful backwater inhabited by Tarascan Indians in the early 1940s. Its gently rolling landscape, in a zone that had experienced almost no volcanic activity during historic times, was one of Mexico's loveliest. Although hundreds of extinct cinder cones rose around the small valleys, the only eruption in human memory had been that of distant Jorullo. The Tarascan had no folk legends concerning volcanic eruptions in the area. But when Paricutín came into their lives, they saw events, in retrospect, that foretold the cataclysm. The first event was a sacrilege: the 1941 destruction of a large wooden cross on a hillside. The second one hinted at biblical retribution: a plague of locusts in 1942. When 1943 began, so did the third sign: a series of earthquakes; these were preceded, said one man, by "many noises in the center of the earth." On February 19, the day before the volcano began to erupt, some 300 earthquakes shook the ground. On February 22, with the new cone rising and fiery skyrockets descending, the first of many geologists who would monitor and map Paricutín's behaviour over the next nine years arrived. From then on, Paricutín was under constant observation: It yielded a trove of information, including unique, fleeting glimpses of ephemeral features. New volcanic phenomena and processes were sometimes obliterated almost as soon as they were recorded, especially during Paricutín's first year of violent, explosive growth and change. In that year, the cone topped 1,100 feet, four-fifths of its final height; explosions echoed all over the state of Michoacan; ash snowed on faraway Mexico City; and almost all of the vegetation for miles around the crater was destroyed. During the summer of 1943, probably the volcano's most violent period. Lava rose to about 50 feet below the crater's rim. That fall, a new vent opened explosively at the cone's base, fountaining lava high into the sky. Lava finally destroyed the nearby villages the following year, but most villagers has seen their livelihoods disappear long before that. Over the next years, lava flows continued with little interruption. 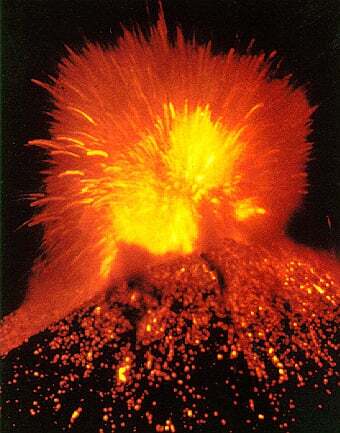 But in February of 1952, almost exactly nine years after Paricutín was born, the volcano experienced its last major spasm of activity. By then, villages and farms had been relocated with government assistance. The new Bracero Program drew many of the displaced farmers to California for seasonal agricultural work.